In the earliest dawn, before the sun has emerged through the paling sky, a sleek, black, yellow-eyed, male grackle nestled in a mango tree breaks the silence with a serenade to the new morning. His tune is of long drawn out notes, cheerful, throaty, subdued, yet loud enough to awaken anyone in the vicinity. The female, brown and smaller, quietly chatters back from a nearby palm frond. The handsome fellow singing with all his heart is also known as a clarinero - one of the abundant bird fauna inhabiting the Isthmus of Panama. An ornithologist's paradise, there are more different birds found here than in all of North America north of Mexico, approximately 850 species. Though the abundance of birds is evident throughout the year, April and early May are especially favorable for bird watching. It is the beginning of rainy season, a time when not only the native species but also the North American birds in migration may be observed. South American species flying to Central America also can be seen. It is estimated that 6 billion birds, adults and young, moving at night from Canada and the United States, migrate to southern United States, Mexico, Central America and South America each winter. A large number of these are seen in Panama. Besides the striking grackle which may be seen most anywhere except the dense forest, are the birds of the tanager family noted for their brilliancy of plumage. They are blue, yellow, green, and red. The crimson and black species locally called "sangre de toro" is usually seen at the edge of the jungle or along the roads in the Interior. At this time of the year, the lovely musical notes of the Panama thrush tanager may be heard ringing out from the jungle. One of Panama's most beautiful birds, this tanager is dark slate with a rose-red stripe on the sides of the forehead broadening in front of the eyes. The male has a loud sweet whistle of notes in different pitches. Related to the tanagers are the honeycreepers, the family of small song birds which abound in the humid, heavily wooded areas of the Isthmus. Bright shades of blue and green predominate in the males and yellow is prominent in some species. One of the most brilliant is the red-legged blue honeycreeper. The male is deep sapphire blue with a turquoise crown. Part of the underwing is yellow and flashes out brightly when the bird is in flight. The female is olive green with underparts of paler and brighter green. The honeycreeper. rarely sings in full daylight, but in the breeding season, the male sings a weak, unmelodious song at dawn. Common and comical to watch in the open fields are the small blue-black grassquits that leap vertically several feet and alight again in the same spot, uttering a few short notes during the jump. On a spotting tour, a birder may also observe on the countryside barred ant shrikes, sparrows, Panama robins, which resemble their northern relatives, hummingbirds, woodpeckers, saltators, wrens, the "pico-gordo," the thick-billed euphonia, which has a sweet canary-like sound, and the flycatchers, which probably outnumber them all. Busy little seedeaters re very numerous at the end of the dry season and the mangrove warbler is always to be found in the swamps. Of special interest to the bird watcher is the oropendula which suspends his long hanging nest from the branches of large trees. The male sings a long-drawn, far-carrying liquid gurgle as he bows forward into an inverted position, raising his wings above his back. Doves are abundant and very tame in the fields, gardens, and along the roads. A flock of ducks is not a rare sight. Shore birds, practically all migrants, are abundant. Sea birds also are numerous and breed in immense numbers on the islands in Panama Bay, Laughing gulls, royal terns, brown pelicans and frigate birds are usually seen along the shore. Another large family of birds is that of the kingfisher ranging in size from a small songbird to a crow. They are found near the water and feed on small fish which they catch by plunging into the water. They nest in holes in trees and banks. The motmots, related to the kingfishers, are beautiful birds of green, blue and russet with graduated tails bare about an inch above the extremities, forming racket-shaped tips. The bird itself preens off the barbs. Motmots are found in the deep forests or dense thickets, often sitting in one place for a long time. A fairly common bird in woods and undergrowth is the squirrel cuckoo, somewhat like the widely distributed long-tailed members of the family. A slow, melancholy call, like a whistle of variations is heard in the savannas. It is the northern striped cuckoo, called "tres pesos" by the Panamanians. The birds call to each other by the hour bringing music to the open fields. Where there are cattle, the tick bird or "garrapatero" is surely to be found as he feeds on insects on cattle. A frog-like croak which may be heard more than half a mile across the open comes from one of the most striking and distinctive of all tropical birds -- the toucan, a large jungle bird. It has an enormous, slightly curved yellowish green bill, nearly as long as its body and very thick. The brightly colored toucan roosts in holes in trees and feeds on fruit. A favorite of bird watchers and non-birders too, is the family of parrots represented by several species on the Isthmus including parakeets and macaws. Their plumage is highly colored and variegated, with green being the predominant color. Parrots are noisy birds with harsh voices and usually nest in hollow trees, the large species inhabiting the deep forest. they remain quiet during the day but can be heard squawking early in the morning and before dark. 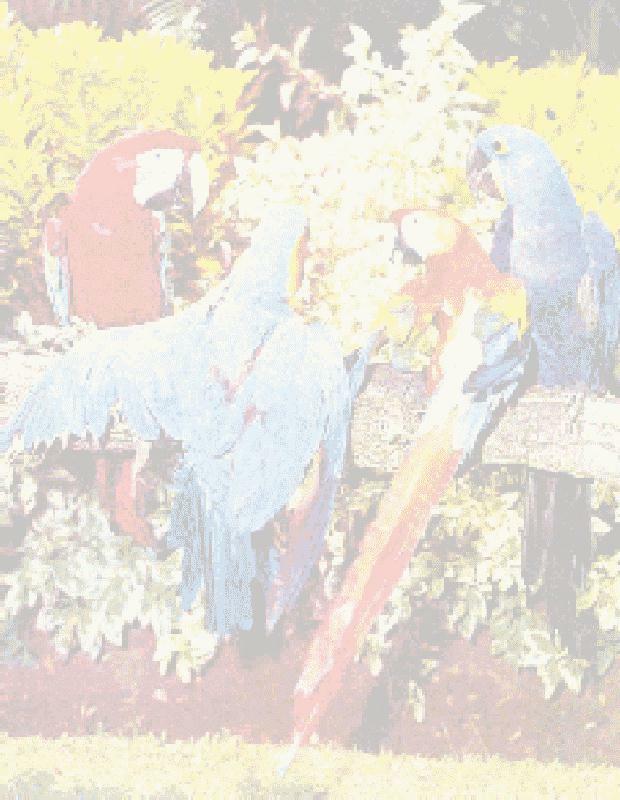 The macaw, the large, magnificent, blue and yellow or scarlet bird, is the showiest member of the parrot family. It has a powerful hooked beak which it uses to crack palm nuts and is extremely noisy. Fairly common, macaws are usually seen in pairs and frequent the tops of trees. One of the most common and widely distributed birds of the Isthmus is the parrakeet. Watchers may observe the orange-chinned parrakeet at sunset going from tree to tree keeping up a shrill chattering as it feeds. The Veragua parrakeet is apple green passing to bluish green on top of his head with greenish blue wings, yellowish below. The bill is horn color. The smaller "perico" is bright yellowish green with a patch of bright orange on his chin and upper throat. These beautiful little creatures are often caught and sold as cage pets. Panama, host to many species common to both North and South America besides its own particular birds, offers a veritable field day to bird watchers.